This paper investigates the position of Instagram influencers within the new media landscape. These influencers started out as ordinary people documenting their everyday life through a stream of photographs (Abidin, 2016b; De Veirman, Cauberghe, & Hudders, 2017). However, they are increasingly emerging as an intermediary between advertisers and consumers. This leads to tensions, as influencers find themselves in a position where they need to present an authentic and trustworthy version of themselves to their audience, while also keeping in mind the demands of the advertisers that they wish to work with. Furthermore, these relationships do not take place in a void, rather they are mediated by the platform Instagram, which, as a corporate entity, shapes the behaviour of its users. This study shows how Instagram influencers negotiate the relationship with their audience, advertisers and the platform Instagram itself, using data from 11 interviews with travel influencers, combined with a visual and textual content analysis of their twelve most recent Instagram posts (N = 132). 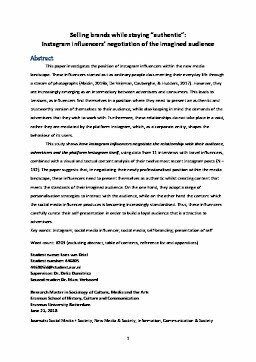 The paper suggests that, in negotiating their newly professionalised position within the media landscape, these influencers need to present themselves as authentic whilst creating content that meets the standards of their imagined audience. On the one hand, they adopt a range of personalisation strategies to interact with the audience, while on the other hand the content which the social media influencer produces is becoming increasingly standardised. Thus, these influencers carefully curate their self-presentation in order to build a loyal audience that is attractive to advertisers.